Reduce, reuse and recycle. These three words have been around since the creation of waste. When you come across them, you probably imagine the way that a box of papers can be melted down and turned into new notebooks or how collections of plastic bottles can be turned into shopping bags. These forms of waste management are the furthest from inspiring—in fact, some may consider them commonplace or boring. As you consider making the choice to go green in everything you do, it may take a little something more to light your fire. Take some time to dive into the hidden world of recycling, a place that you would never venture unless you worked there. You’ll find some incredible, unimaginable things that once lived an entirely different life. You’ll probably be surprised to find that some of the things that decorate the walls of your home are counted among these treasures. We’re living in a world of waste. With 7.6 billion people on the face of the planet, that’s a lot of trash to take care of and not a lot of places to put it. That’s not a unique thought, but something that many folks never consider. However, it gets more surprising when you put numbers to the amount of waste. The world as a whole produces 1.3 billion tons of waste each year. At the rate of growth we’re experiencing, in 80 years the amount of waste could bounce up to more than 4 billion tons annually. What kind of waste management system is equipped to deal with that? Unfortunately, for those trying to do the environment good nearly ¾ of plastic bottles still end up in landfills, not to mention the amounts floating in the oceans. Thinking green isn’t something that only a few good people can do to fix everything. It takes a team effort from the billions of people across the planet. Something old and something new — most things that are recycled become exactly what you imagine they will. You weren’t wrong when you imagined that old paper becomes new paper and aluminum will be shaped into soda cans. The process can be pretty straightforward; that is, until you bring creative people into the mix. If you don’t work in the industry, you truly have no idea the magic that can go on behind closed doors. One man’s trash will truly be another man’s treasure with enough hard work. 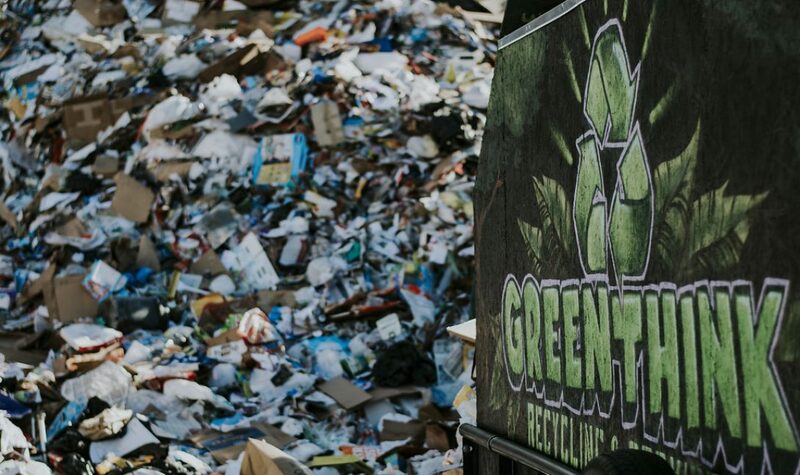 Dig deeper into this blog to scratch the surface of what thoughtful waste management can do to your trash. Some items come together as a hodge podge of other things. These aren’t the most colorful or imaginative items to spark that fire, but they are a start. For instance, though you walk on it daily you may never have thought about how asphalt is made or what it’s made of. Asphalt typically comes from things like the rubber of tires or roof shingles. The recycling process is pretty simple, in that they break down the old items and mash them into something brand new. The same can be said for bricks. Though they surround your home, have you ever considered what’s inside of them? Much like asphalt, these building blocks are the “hotdogs” of recycled items (meaning they are put together from countless odds and ends). Take a closer look and you may find yourself face to face with all kinds of pieces of glass — cups, bottles and dishes — that catch a beautiful glimmer in the sunlight. If you’re recycling old paper, you may in fact be contributing to someone’s new cat litter. As far-fetched as it may seem, this form of recycling can be a breath of relief for anyone who suffers from allergies that traditional cat litter can bring. Paper litter produces less dust and is more economical, which is a win on all sides. Finally, when you stare into your closet picking your outfit for the day, you may as well be looking into a recycling bin. Many clothing brands have worked discarded plastic fibers into some of their synthetic clothing (clothing that includes workout clothes). These outfits can be some of the softest that you own. Speaking of clothing, as she marched down the red carpet Emma Watson let her fans know that one of her recent dresses was made from three fabrics built out of recycled plastic—talk about think green. This was the perfect opportunity to let her fans know that they should look for clothing that they can wear at least 30 times to reduce waste; and what a way to inspire another generation to improve their waste management efforts. There is a company in North Carolina that breaks plastic down into pebbles, elevating their own recycling. The pebbles are then processed and turned into yarn. This yarn is given an incredible new life, and it is brought with you to some of the most important days you’ll have. No, you’re not expected to carry this yarn, it’s actually formed into graduation gowns. This yarn is made into graduation gowns. Talk about “think green”. Recycling can also feel counterintuitive. For example, you use your toothbrush to get a good clean after breakfast. Depending on the brand you purchase, your toothbrush may actually have a handle that was made from old yogurt cups. As odd as it sounds, this is totally sanitary. If you visit the right online store, you may come across an FM radio made from recycled cardboard. Yes, you read that right, a cardboard radio. Batteries and an antenna power this machine. When you’ve gotten all the joy out of it that you can, you can even put the radio right back into the recycling bin, bringing waste management full circle once more. Then we have the everyday items that have been brought back to life in less subtle ways. There are the records that get turned into bowls. They are melted down and shaped around traditional glass. After they’ve cooled and the bottom has been closed, they can be decorative for the music lover or just a cool way to enjoy your oatmeal. Major league baseball bats can get turned into bottle openers. This practice is perfect for the sports lover. Each opener is printed with serial numbers that point out what game they were from and who used them. Even the playgrounds that line our schools, which are constantly inhabited by the youngest in our generation, get built out of recycled milk jugs and rubber tires. What a perfect opportunity to share the importance of recycling. There is no shortage of creativity. Some companies have taken it upon themselves to change the world in leaps and bounds that the average person can’t make. Adidas recently announced that they would turn 11 million plastic water bottles into 1 million sneakers—what an impressive way to go green. Year over year Ford continues to increase the amount of recycled materials that go into their cars. As a company, they have made it clear that responsible waste management is important to them. Countless companies are getting on board and turning up their recycling efforts. Now that you understand a minor part of the astonishing side of recycling, it’s time to do your part and go green. Pull out your phone and do a quick search for a recycling center near you to get involved. Little by little, we can take care of this planet and make it better for the people to come.